This paper offers a methodology for researchers to facilitate reciprocal learning across contexts and disciplines from planning to implementation of innovations within complex multisite implementation research projects. Using a framework has an added value to guide the collaboration and keep the balance between implementation fidelity and flexibility. Reciprocal learning facilitates contextualisation, but the process needs careful management with due attention to output and relations. In the SMART2D (Self-Management Approach and Reciprocal learning for Type 2 Diabetes) project, this resulted in the identification, adoption and adaptation of a type 2 diabetes self-management support intervention in three vastly different income settings and groups. This paper answers the call for cross-contextual learning to advance implementation research on T2D and other chronic diseases, by describing a research project that prioritised reciprocal learning as an approach and outcome. The last decades have witnessed a rising interest in this type of research, but little is known about the barriers and facilitators of implementation. The aim of this paper is to analyse the process and methodology of reciprocal learning, by providing a summary of the method, learning cycles and lessons learnt so far in this project. The ‘Self-Management Approach and Reciprocal learning for Type 2 Diabetes’ (SMART2D) research project was established in 2014 following a European Union H2020 call for implementation research. The collaboration included anthropologists, behavioural scientists, epidemiologists, diabetologists and health systems experts, who worked in three different settings: a rural area in Uganda (low-income country), a semiurban township in Cape Town, South Africa (middle-income country) and socioeconomically disadvantaged suburbs with a high proportion of immigrants in Stockholm, Sweden (HIC). These settings were purposefully selected because of their differences but also opportunities in terms of reciprocal learning (box 1). Sweden: The age-adjusted prevalence of diabetes in 2016 was 5.8% (3.2%–9.3%) for men and 4.0% (2.1%–6.6%) for women.2 The rates however show a range of values from 3% to 22%, and prevalence is higher among vulnerable groups, such as migrants. Swedish healthcare facilities are well resourced and offer personalised support strategies for prevention and health promotion, including innovative strategies such as ‘physical activity on prescription’. SMART2D, Self-Management Approach and Reciprocal learning for Type 2 Diabetes. Each context has particular strengths: experience with community involvement in HIV/AIDS/tuberculosis care in Uganda and South Africa17 18; evidence-based models for integrated NCD care in South Africa19; and strong facility-based diabetes care and NCD prevention tools in Sweden.20 Acknowledgement of the gaps and strengths in each setting was used as a basis for reciprocal learning, using knowledge transfer and its application. The main objective was to formulate and implement a contextually appropriate self-management strategy for the prevention and control of T2D in each setting and to evaluate its outcomes. Process objectives were to develop a reciprocal learning approach to increase contextual understanding and its impact on intervention development and implementation, and knowledge translation to influence national policymaking and guidelines. Evidence Integration Triangle as outlined in the SMART2D project proposal. HWs, health workers; SMART2D, Self-Management Approach and Reciprocal learning for Type 2 Diabetes. The work process in the project was structured into three phases with corresponding learning cycles, involving problem clarification and the development of a Theory of Change or ToC (formative phase); development and contextualisation of the intervention framework (intervention phase); and implementation and evaluation of the intervention (trial phase). The learning cycles partly overlapped, illustrating their interlinkages and the continuous matching of evidence and context. Each cycle was facilitated by a consortium partner and addressed elements of the EIT framework. Research has shown how a ToC can inform implementation of health systems innovations.22 In this learning cycle, problem clarification helped develop a ToC, which emphasised that diabetes self-management is influenced by the patient–provider interaction and responsiveness of health services, which in turn are influenced by the active involvement of patients and their families, professional providers, and community actors. The cycle resulted in three situational analyses that revealed opportunities and threats for potential intervention. In the Ugandan context, the limited capacity and resource constraints of health services, coupled with insufficiently detailed care guidelines and overall lack of clarity on self-management, hindered responsive care. Opportunities for change included improving service delivery to reach minimum levels of quality care and strengthening patient involvement. In South Africa, the environment acted as a barrier to improving self-management through its impact on diet and physical activity. Opportunities for change included strengthening of community-based groups to advocate change, improving the link between community health workers (CHWs) and health facilities, and strengthening patient roles through behavioural coaching. In the Swedish site, immigrants and other disadvantaged groups experienced delays in receiving health services, limited cultural understanding and trust, and compromised patient–provider interactions in relation to self-management advice.23 Opportunities for change included establishing a link between patients and health providers, local administrations and community-based organisations to facilitate understanding, social support and trust. Gaps in one setting were addressed by looking at experiences from other field sites. Care models from Sweden and South Africa informed the development of algorithms, patient stratification and motivational health counselling in Uganda. In Sweden, identification of community actors and their potential role was guided by the experience of working with CHWs in South Africa and Uganda. A tool to evaluate the food environment (Environmental Profile of a Community’s Health)24 was adapted in South Africa, and translated for use in Sweden and Uganda. The overall output was an improved ToC with more emphasis on the community, environment and relationships between different actors. A generic framework was developed including common strategies for facilities (organisation of care, strengthened patient roles) and communities (community mobilisation, environmental support and community extension). Strategies were selected using situation analysis, literature review of evidence-based interventions and stakeholder workshops. The engagement with stakeholders of different levels was organised in multiple sessions, starting with an inclusive introduction workshop followed by repeated interactions with smaller groups or key individuals in the community or health system. Cross-site workshops were organised to contextualise these strategies and select optional components, which resulted in the coproduction of a common set of tools and site-specific strategies. The Ugandan site developed guidelines for facility-based diabetes care, health education and motivational coaching, guidelines for a community-based peer support group programmes, and guidelines for care companions. The South African site produced material for peer support group activities and developed health education materials and group tools to evaluate the local food environment in collaboration with the Swedish site. The latter also developed specific tasks for the community link team and different models for community-based mobilisation and screening, based on experiences from Uganda and South Africa. In Uganda, site-specific strategies focused on improving quality care by providing equipment and supplies, developing and implementing guidelines and task-shifting, and strengthening self-management by establishing community-based peer support groups. In South Africa, strategies for improving self-management included developing a peer group-led community walk for patients to help understand and navigate the local food environment, and involving CHWs to provide individual patient care and assist in peer group development. The Swedish site developed links between health facilities, local administration and community actors, and introduced the concept of a ‘community link team’ to formalise these linkages. This learning cycle focused on implementing and evaluating the intervention, which mainly consisted of an adaptive implementation trial.25 Dialogues with stakeholders and findings from the previous learning cycles helped refine the target population, recruitment strategies and evaluation questions for each site. A pragmatic cluster design was used, with clusters consisting of facilities and their catchment area. Inclusion criteria for study enrolment were identical across sites, but site-specific algorithms were developed to screen and recruit participants based on resource availability, current practices and national guidelines, and logistical arrangements.25 The trial is guided by a generic trial protocol, implementation guide and evaluation tools. In Uganda, nine clusters were randomised into three study arms to compare usual with optimised facility-based care and facility-based plus community-based care. In Sweden, to facilitate trial acceptability, the target population was expanded to all adults living in selected clusters irrespective of their place of birth. Recruitment of participants revealed challenges in mobilising the target population, which shifted the focus towards evaluating implementation feasibility. In South Africa, population density and risk of study contamination resulted in selecting two clusters based on pragmatic considerations, such as implementation feasibility and avoidance of overlap with other studies. The consecutive learning cycles also helped teams to understand the change process, to create a platform for knowledge exchange and shared learning, to think outside the box, and to optimise problem-solving capacity. 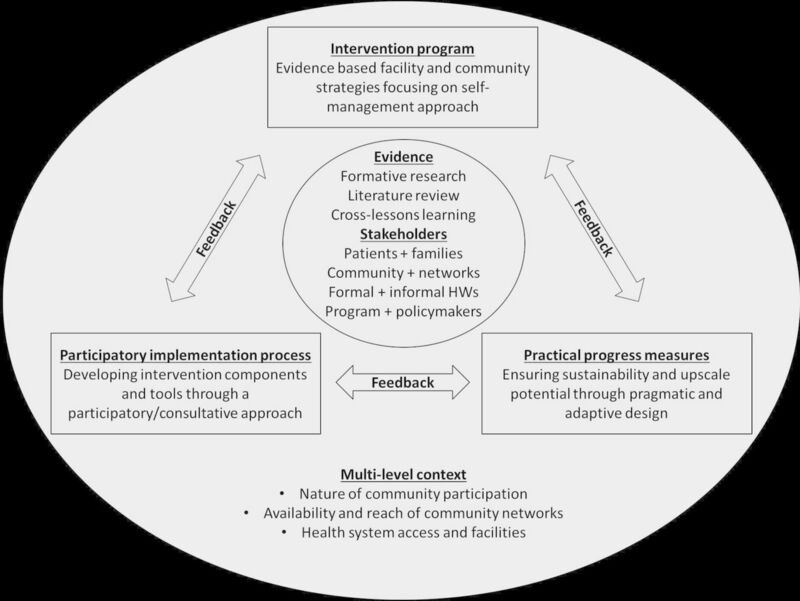 While many multisite intervention studies emphasise intervention fidelity to allow cross-site comparison, the approach taken in this study allowed harmonisation of the intervention by function rather than content, in line with the recommendation to find balance between fidelity and local adaptation.28 The intervention strategy of ‘linking the health facility with the community’ was hence tackled differently in each setting depending on context-specific needs, for instance face-to-face meetings to receive support materials or phone calls to inform about patients. Reciprocal learning took place in each learning cycle through workshops, monthly teleconferences and periodic debriefings, as illustrated in table 1 and figure 2. There was a 5-day face-to-face workshop for each learning cycle, in which researchers from each country participated and which was facilitated by the person in lead of that learning cycle. The learning was facilitated by the generation and application of evidence within and across contexts, and by collaboration with local stakeholders. Outputs were described in project documents and deliverables, and the trial protocol was published as a scientific paper.25 The framework and methodologies were instrumental in maintaining the reciprocal learning focus, providing a robust yet flexible framework to structure learning in each cycle. This allowed for a balance between evidence, stakeholder needs and pragmatic contextual adaptation. The three learning cycles and reciprocal learning opportunities depicted using the Evidence Integration Triangle. NCD, non-communicable disease; NGO, non-governmental organisation; SA, South Africa; SMART2D, Self-Management Approach and Reciprocal learning for Type 2 Diabetes; SW, Sweden; UG, Uganda. Managing the outputs of the learning process to achieve feasible strategies for implementation and evaluation, however, is complex and unpredictable, and depends to a large extent on individual commitment, relationships and team performance. Actors are crucial in shaping the collaboration, and member and team interdependence sometimes resulted in delays and friction around common goals, which required early recognition and team building to instil trust and ownership. Interpersonal processes such as communication networks, conflict resolution strategies and leadership styles influenced team readiness for collaboration and the capacity to work together effectively over extended periods of time.29 Each learning cycle lasted for 1 year and the time commitment included monthly contact moments with each country team. Content expertise on the intervention and the methods and actor autonomy also facilitated a more focused collaboration and allowed tensions to be solved more easily. The reciprocal learning approach as applied in this project allowed for a structured methodology and framework for the cocreation of knowledge and advancing implementation solutions for global health problems. The approach allowed for an indepth understanding of contextual differences in improving self-management of T2D and for the adaptability of solutions. The learning culture and emphasis on cross-lessons facilitated interactions within and between partners beyond specific research activities and can be considered relevant for the wider regions (Europe and sub-Saharan Africa) represented by this collaborative partnership. Patients were involved from the first learning cycle and in all subsequent phases in the study. This was done through workshops in each site, involving collaborations with patient organisations or clubs in each country. In Sweden, we also worked with local ethnic associations to involve people who were not (yet) identified as patients. The discussions and testing of ideas with patients and associated groups led to the development of the intervention focused on the problems experienced by the patients. The implementation of the intervention was adapted to overcome barriers to participation. For instance, potential patients in Sweden preferred to have a ‘one-stop-shop’ approach to recruitment, which led to the adaptation of the procedure. The SMART2D consortium includes the authors of this paper. We also acknowledge the contributions of other researchers of the SMART2D consortium, including Elizabeth Ekirapa Kiracho, Juliet Aweko, Juliet Kiguli and Linda Timm.
. A/RES/70/1. Transforming Our World: the 2030 Agenda for Sustainable Development, 2015.
. Final report of the Knowledge Network on health systems. In: Challenging inequity through health systems, 2007.
. Standards of medical care in diabetes - 2017. Diabetes Care 2017;40(S1):s4–s128.
. The PIH Guide to Chronic Care Integration for Endemic Non-Communicable Diseases. Boston, MA: Partners in Health, 2011: 153–85.
. The strategic teacher: Selecting the right research-based strategy for every lesson. Alexandria, Virginia: Association for Supervision and Curriculum Development, 2007.
, 2014. Quality and efficiency of diabetes care in Sweden: National Performance Assessment 2011.Available from: https://www.socialstyrelsen.se/Lists/Artikelkatalog/Attachments/19393/2014-3-18.pdf [Accessed 1 Jul 2018].
. Global health programs and partnerships: Evidence of mutual benefit and equity. Washington, DC: CSIS Global Health Policy Center, 2016.
. Primary health care: integrated audit report for non-communicable chronic diseases, Cape Town district 2016/17. Cape Town: Western Cape Department of Health, 2017.
. The 2012 SEMDSA Guideline for the Management of Type 2 Diabetes (Revised). J Endocrinol Metabol Diabetes S Af 2012;17:S1–S95. JvO and PD are joint first authors. SP and MD are joint senior authors. Contributors JvO, PD and MD conceptualised the format of this paper and developed the several drafts. SP gave conceptual input to the development of the study and of the paper. DG, GT and PA provided textual and structural comments to the different versions of the manuscript. CG-O, DS, CJS and TP participated in the development of the approach and gave comments on the manuscript. All authors read and approved the final version of this manuscript. Funding This work was supported by the European Commission's Horizon 2020 Health Coordination Activities (Grant Agreement No 643692) under call 'HCO-05-2014: Global Alliance for Chronic Diseases: prevention and treatment of type 2 diabetes'. The content of this article is solely the responsibility of the authors and does not reflect the views of the EU. Ethics approval The study was approved by the ethics committee in each of the respective countries, including the Higher Degrees, Research and Ethics Committee of Makerere University School of Public Health and the Uganda National Council for Science and Technology (Ref HDREC-309 and HS 1894, respectively) in Uganda; the Office of the Dean, Department of Research Development (Ref 15/3/17) of the University of Western Cape, South Africa; the Regional Ethics Review Board in Stockholm (Ref 2015/712-31/1), Sweden; and the Institutional Review Board (Ref 993/14), Institute of Tropical Medicine, Belgium. Patients participating in the trial have signed informed consent to participate in the trial.